A huge thank you to Bunji Garlin for leaving his mark on feters in both Calgary and Edmonton last weekend! 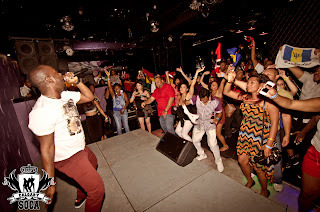 The 'Viking of Soca' brought the 'differentology' show first to Calgary on Friday night alongside the CalgarySoca crew and DJ Soca Sweetness for what turned out to be an epic VIP concert experience. Bunji did favourite after favourite for over an hour on Friday night, and was gracious enough to stick around for pictures well after his concert performance, giving his Calgary an experience to remember. Saturday he was in Edmonton for the city's annual Cariwest festival. Bunji Garlin brought down the house at what is now officially Alberta's largest Soca fete ever with over 1000 in attendance at Encore nightclub! Thank you to IV Entertainment for the Edmonton hospitality and an amazing experience. Check out the Edmonton pics here.